The ultimate in Old World romance and feminine elegance, a Victorian-inspired bridal shower remains the dream of many a bride. It recalls a time when antique lace and feathers were fashion staples, when poetry reading and genteel tea parties were afternoon pastimes, and when refined young ladies blushed at a suitor’s glance. Charm guests into feeling as if they’ve wandered into this bygone era with a boudoir-style setting decorated with frills and lace. But don’t stop there. Continue the air of romance by selecting shower favors in sweet, pastel hues with exquisite detailing. Pretty lace and tulle bags made with delicate lace and pearls cast a sweet reminder of the Victorian era. Fill them with candies with a nostalgic feel and attach a favor tag thanking each guest. 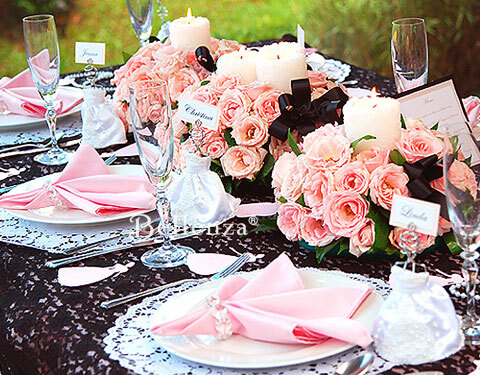 Alternatively, have them hold scented favors like flower-shaped soaps, rose-fragrance bath lotion, or floral potpourri, and add a lovely personal note from the bride. Or for a truly Victorian feel, tuck Earl Grey or English Breakfast tea bags, small fabric-covered journals, or petite books of Elizabeth Barrett Browning’s love sonnets (Sonnets from the Portuguese) into these purses as delightful keepsakes. 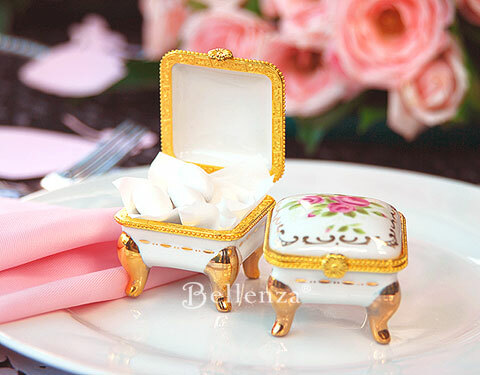 Another wonderful favor idea is to give antique-inspired porcelain boxes that pay homage to those romantic Victorian days, whileholding sweet treats. With their rose motif, footed design, and gold trim, these boxes make lovely dresser accessories or jewelry holders when taken home. 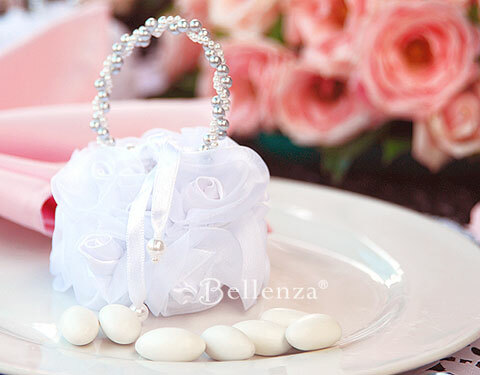 At the shower, fill them with white sugar almond dragées and place them atop each place setting—either with lids open or tied closed with a charming pink ribbon. For a festive presentation, arrange them on an elegant favor display table laid with a vintage patterned tablecloth such as damask, with a scattering of loose rose petals. Lastly, a decidedly Victorian-style memento for shower guests would be miniature satin bridal gowns referencing the fashionable elements of that era. Use these whimsical keepsakes as place card holders at each place setting, or assemble them around a grand bridal shower cake on a Victorian-motif dessert table. 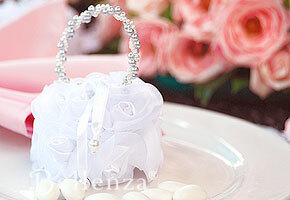 Alternatively, display these mini gowns on the reception or guest book table to serve as welcoming favors. When taken home, they may hold a special thank-you card or perhaps a photo to remind guests of this happy occasion. If you love this post, be sure to check our vintage-travel themed favor ideas. The shower menu is another key area where the vintage theme can shine! Since this is a tea party, light fare is in order. Perfect choices would be single-serve savory items such as mini quiches and hand pies, tea sandwiches with egg salad, salmon, and cucumber fillings, and meat-filled croissants. For sweets and petite desserts, set out macarons on pastry stands or inside cut-glass jars or glass cloches. 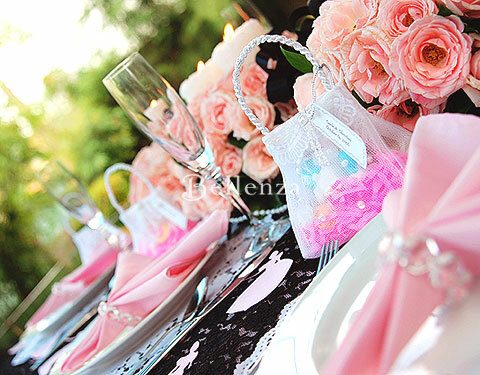 Croissants filled with chocolate or jam, along with ladyfingers and frosted pastry bites would make the prettiest “centerpieces” displayed right on the tea party tables. Think petit fours, eclairs, and creme puffs that would make equally dainty choices. A side table can hold a sweet array of confections and candies for guests to choose from, with bunches of fresh flowers providing the romance. You may also want to provide sweets like buttermints, marshmallows, and chocolate truffles. Even simple glazed donuts can find a spot on the dessert display, accompanied by blooms in floral-patterned tea cups. Finally, treat your guests to a selection of fine teas – from Earl Grey and English Breakfast to chamomille, orange, lemon, peppermint, and green tea – served in a vintage silver teapot and delicate china tea cups.